This ambitious project showcased our talent for discovering high-potential sites that are routinely missed by the rest of the market. 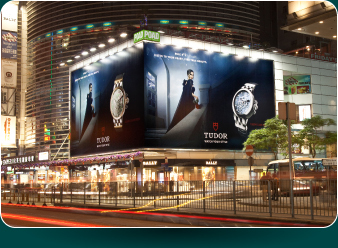 Such insight leads us to consistently break new ground in outdoor advertising, optimising revenue possibilities for property owners through projects that provide a real 'wow' factor. Our work at this site in 2010 demonstrated the lengths – and heights – we're willing to go to in order to succeed. The New World Centre complex on the Kowloon waterfront set our creative minds racing. Here was the opportunity to produce one of the city's most eye-catching displays of advertising theatre by wrapping a colossal building – to be redeveloped later that year – in an advertisement measuring 8,000m². From an unused structure to a lucrative asset that enthralled a city, POAD's visionary transformation created unprecedented success for all involved. Hong Kong's tram network is iconic – synonymous with the unique feel of our city. In 2003 POAD jumped on board, becoming the exclusive marketing agent for the city's tram shelters for over 14 years. We were the FIRST in transforming these bland stations into valued additions to our preceding portfolio, realising their limitless potential to communicate with a city that is constantly on the move. POAD is committed to ensuring each and every one of our sites delivers maximum impact. 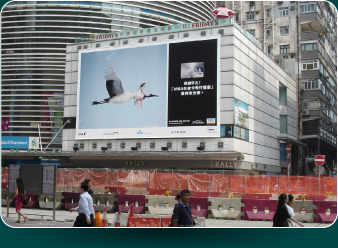 We felt the single-sided billboard on the façade of 26 Nathan Road, Tsim Sha Tsui, did not do justice to the potential of this bustling, high-traffic location. Our solution was to stretch an L-shaped billboard around the building, drawing attention from both sides and creating an advertising dream for a range of brands. Such imaginative use of advertising space allows us to fully meet the needs of every client, surpassing their expectations and guaranteeing high-profits across the board.